Tribute albums come in many varieties: to raise money for charities, to commemorate an event, or just to cash in on someone famous. This one's for Disney! For September, we were hosred by William McCabe, who’s spent most of his life in Birmingham and has “met far too many bands that you’ll probably never have heard of”. William also spent two years as a presenter/producer for internet radio station Rhubarb Radio with two hours a week of some of the oddities you find for free on the internet. He also regularly inflicts his lack of taste in music on attendees at a local vinyl night once a month. 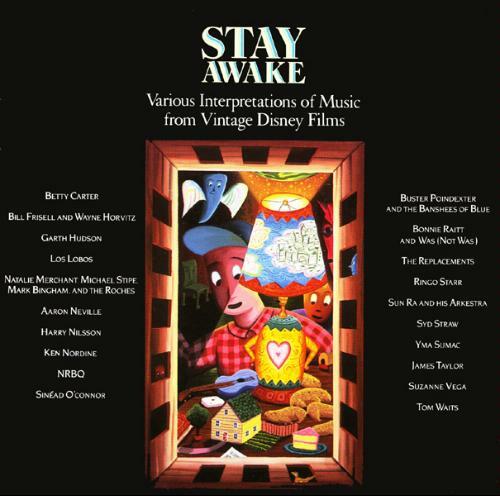 The album William picked is one of Hal Willner’s many tribute albums, “Stay Awake”, released in 1988. The album’s devoted to well-known songs from Disney movies. The versions aren’t always copies of the originals, and sometimes they aren’t even recognisable. The album features country singers, alt-rock bands, some odd personalities and some extremely well-known ones. For just over an hour, it’s a fairly good representation of the tribute album as a genre. The album was long: just over an hour, and covering music from Dumbo, Snow White, Mary Poppins, and the Jungle Book (amongst others). Standouts included Sinéad O’Connor’s very brief (1:08!) “Some Day My Prince Will Come”, recorded perhaps in a hotel lobby, and Aaron Neville’s beautiful, soulful “Mickey Mouse March”. Reactions varied with some folks liking the mixture of genres, singers and sounds, and others finding it a bit too long or just not quite gripping enough. Our technical tools (er, a calculator) let us down so a rigorous mathematical average score was not computed, but based on the numbers offered up by the room, a finger-in-the-air estimate suggests a 6.7 / 10 or thereabouts. * These songs aren’t on Spotify! 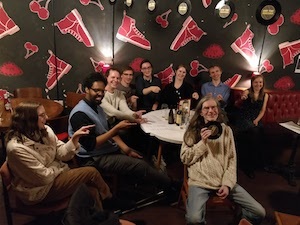 After this, it was the end of the night – thanks to William for hosting. See above to see who nominated each song which matched our theme, "Tributes".